作曲家喬爾.邦斯說: "遊牧民族"像在一次旅遊中主角大提琴家奎拉斯"遇見"來自不同傳統的音樂家們並與他們進行音樂對話. 這不是一首大提琴協奏曲, 而是一首大提琴與來自其他文化的獨奏音樂家們之間的協調音樂作品. 在大約一小時的播放長度中, 這張專輯是由38首短音樂片段組成, 大多數是中間不暫停的連續播放下去. 有兩種音樂素材像線一樣的穿插在所有作品中: "遊牧音樂"(Nomad-music)重複了8次但每次都以不同的方式呈現, 還有一種被稱為"通道"(Passages), 是一兩個音調(tone)或和弦上的靜態段落(episodes)用來探索樂器的各種音色. 這些素材引入了各種"主要的"段落並穿插大提琴與其他文化的樂器的相遇對話. 邦斯為奎拉斯和他在2002年創立的亞特拉斯樂團(Atlas Ensemble)編寫遊牧民族音樂作品, 該樂團是由18位來自中國,日本,中亞,中東和歐洲的傑出優秀音樂家組成. 從日本的尺八(shakuhachi), 中國的二胡(erhu), 亞美尼亞杏木雙簧管(duduk)到波斯的錫塔琴(setar), 樂器總譜法(scoring)提供無數種的組合和許多未曾聽過的音色. "遊牧民族"在2016年由這些音樂家首演, 指揮是艾德史班加德(Ed Spanjaard), 此作品在2019年剛獲得美國路易斯維爾大學聲望很高的Grawemeyer作曲獎. 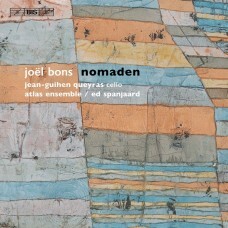 In the words of composer JoelBons, 'Nomadenis like a journey during which the protagonist –cellist Jean-GuihenQueyras–"meets" musicians from different traditions and enters into dialogue with them. It is not a cello concerto as such, but rather a concertantework for cello and soloists from other cultures.' With a playing time of roughly an hour, Nomaden('Nomads') is made up of 38 brief sections, most of which run into each other without any pause. Two types of musical material run like a thread through the work: the 'Nomad-music' which return eight times but always presented each time in a different light, and the so called 'Passages': static episodes on one or two tones (or a chord) that explore the various instrumental timbres. These lead into the various 'main' episodes featuring encounters between the cello and the instruments from other cultures. 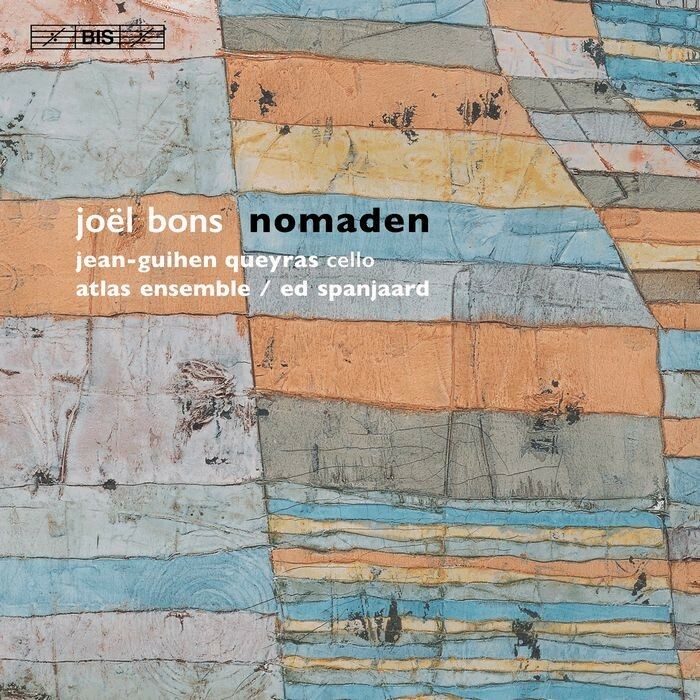 Bonscomposed Nomadenwork for Queyrasand the Atlas Ensemble–a group he himself founded in 2002, made up of 18 eminent musicians from China, Japan, Central Asia, the Middle East and Europe. From the Japanese shakuhachiand Chineseerhuto the Armenian dudukand the Persian setar, the scoring offers an untold number of combinations and an unheard spectrum of timbres. Nomadenwas premièred by these performers in 2016, under the baton of Ed Spanjaard, and has been awarded the prestigious 2019 GrawemeyerAward for Music Composition.